On the afternoon of April 11, 2019 local time, Premier Li Keqiang met in Dubrovnik with Prime Minister Peter Pellegrini of Slovakia, who was here for the summit between China and Central and Eastern European Countries. Li Keqiang expressed that this year marks the 70th anniversary of the establishment of diplomatic relations between China and Slovakia. 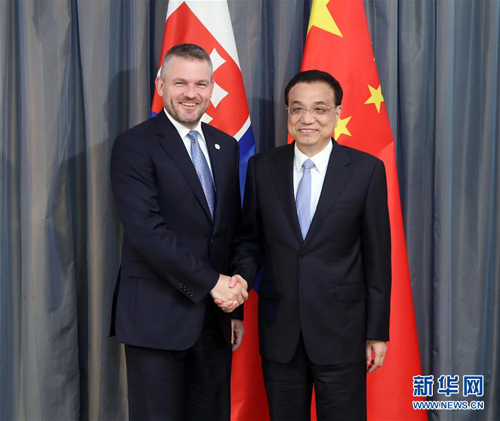 The Chinese side is willing to join the Slovakian side in meeting each other halfway, enhance bilateral political mutual trust and promote bilateral relations to develop along a sound track. Markets of China and Slovakia are highly complementary to each other. China will always keep the door of its market open and welcomes Slovakia's export of high-quality specialties including agricultural products to China. We are willing to better align the Belt and Road Initiative with the development strategy of the Slovakian side and deepen cooperation in such fields as digital economy, transportation and logistics. The Chinese side supports its capable companies in participating in Slovenia's infrastructure construction. Chinese companies always strictly stick to local laws and regulations, and the two sides should ensure them a fair and non-discriminatory competition environment. Peter Pellegrini noted that the Slovakian side is ready to take the 70th anniversary of diplomatic relations between the two countries as an opportunity to further enhance bilateral relations, expand cooperation at all levels, and intensify communication and coordination in multilateral areas. The Slovakian side welcomes Chinese investment, stands ready to open its market to Chinese companies and will provide them with fair, equal and non-discriminatory treatment.